This was one of the best films I saw last year, it was the best film at the New York Film Festival. It was so good that every film I saw at NYFF was compared to it- "Yea it was good but it's not GUY FROM FENYANG". I talked about this film endlessly. I desperately wanted it to show up at DOC NYC or somewhere so I could see it a second time. This is one of the best films on film you'll ever see. Its a film that will make you reconsider Jia Zhangke's body of work. I know it made me do it. I wanted to go back and rewatch all his films all over again because this film opens up what the films are about and how they came about. It's a film that is not only about a body of work but all all bodies of work. In listening to Zhangke talk about where his films came from I could see where my stories were coming from. Some times the most specific of films speak to the larger world. And now it's getting a release from Kino Lorber starting Friday and if you love the movies you really must go. It will change the way you see movies. And in honor of the release I'm reposting my NYFF review. 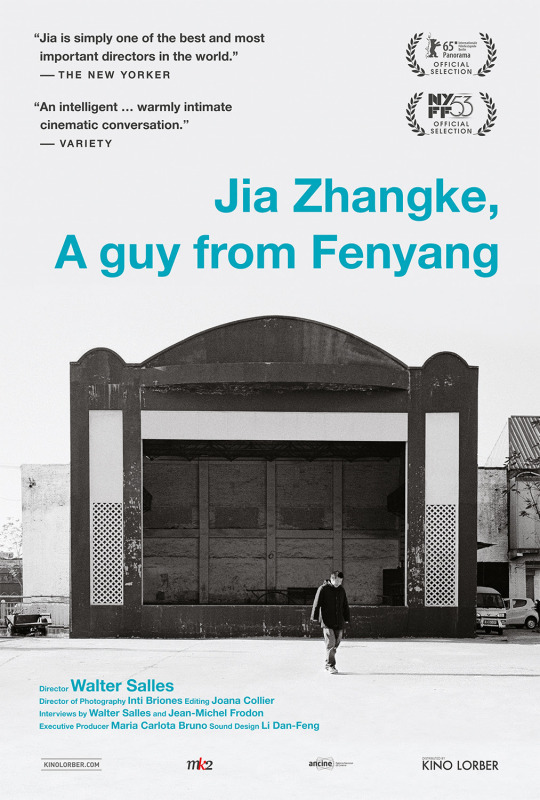 Walter Salles' documentary about filmmaker Jia Zhangke is fantastic film that works on so many different levels. This is one of those great documentaries that not only makes you appreciate a filmmmaker's body of work, but wants you to go out and track down all the films all over again. First and foremost it is a wonderful portrait of the director and what makes him tick. Over the course of the films 100 minutes we get to know the director and what makes him tick. There is a very real sense of Zhangke is or at least how Walter Salles sees him. 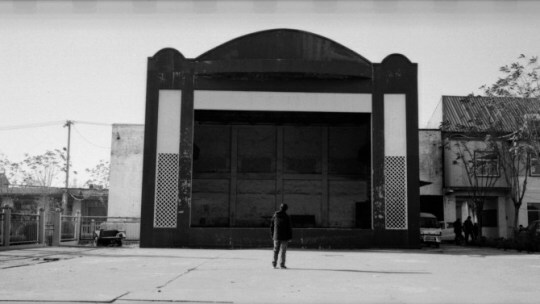 Structured as a series of visits to the locations of Zhangke's films the film brings us into the world of the films and their director. Beginning with the Zhangke and one of his friends walking the streets of his home town we fall into this story as old friends and family appear and tell stories and reveal details of what it was like way back when. We get stories that spill out of everyone as the simple acto of walking down the street he grew p brings forth tales at every house. For example he says that his mother said he was raised by a hundred families since he would wander the streets and see who was serving what for dinner and then simply take a chair and join in if it was something he wanted. Listening to the stories you really get this wonderful sense of why we have the films we do. You also get a sense of the man himself, who seems like a really nice guy you'd want to hang out with and have a beer. A GUY FROM FENYANG is an enlightening portrait of Chinese society from about the time that the director was born until now. We see how the politics and societal shifts affected not only Zhangke's films but also himself and the world he lives in. We also come to understand why his films have been banned over the years. The Chinese authorities really don't want the lives of the people to be revealed in such a way as to show the poverty, corruption and desire for something better. You understand where the frustration of some people that explodes across the screen in A TOUCH OF SIN comes from. The banning or censoring of Zhangke's films takes the forefront several times in the film. We hear the story of his father seeing PLATFORM for the first time and not saying anything, only to tell his son the next day that in an earlier time he would have been hailed as counter revolutionary. There is a discussion on a train trip where Zhangke talks about how he ran into a guy who had a great bootleg film coming in. The film was PLATFORM and it was a moment of mixed emotions for the director who realized that his film was being seen by people. Lastly we watch as A TOUCH OF SIN 's release is canceled and Zhangke seriously considers hanging up making films because of all the trouble they are causing. I'm sorry my words describing the film are not doing this film the justice it deserves. Blame it on the fact that I was so overwhelmed by this film that I couldn't take it all in. In all seriousness despite taking notes I still feel as though I need to see the film a couple more times before I can really talk about the film in it's entirety. As I said this film is revealing things on multiple levels and I know I missed stuff my one time through.